Accounts payable ratios tell us how long it takes a company to pay its suppliers, creditors and whether the company is in a good position to obtain short term financing in the form of cost-free funds. Short-term creditors such as banks, credit unions and line of credit companies view the accounts payable ratios as indicators of a company’s financial strength. How is Accounts Payable Ratios Computed? Assume the following data derived from the Income statements & Balance sheets of Juakali Corp. for its 2009 year. 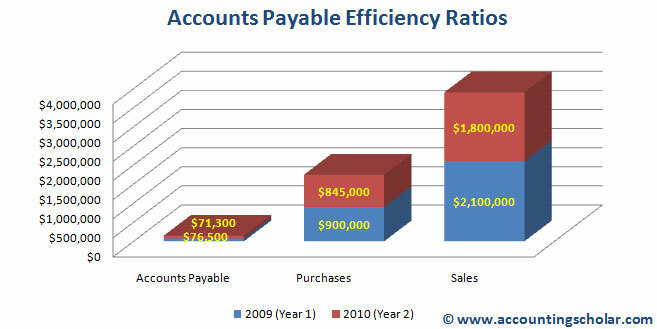 Notice that the sales to accounts payable ratio went down from 27.45 in Year 1 (2009) to 25.25 in Year 2 (2010); an improvement of 8%. This indicates the company’s improved ability in year 2 (2010) to obtain short term credit & financing in cost-free funds. This ratio simply means the company is making more sales and is lowering its accounts payable by a certain percentage, which is good for investors & the outlook for the balance sheet. Below we present the data in graphical format. The decrease in the days’ purchases in accounts payable from 30.60 days to 30.38 days is also a positive sign because it says the company is able to repay its suppliers & creditors faster, on all the purchases it has made. How are these Formulas Used and by whom? Short term creditors, financial managers & lenders use these accounts payable ratios as indicators of a company’s financial strength to make punctual payments on its accounts payable & liabilities outstanding. For instance, if the value of sales to accounts payable suddenly increases, then the lenders may suspect the company is having trouble converting its sales in to cash and promptly be able to pay its suppliers. The days’ purchases in accounts payable determines the average number of days it takes for the company to pay its short term suppliers & creditors. This ratio is used by financial managers to determine the extent to which accounts payable represents current liabilities rather than long overdue liabilities. A decline in the days’ purchases in accounts payable could signal the company has better cash flow management procedures in place, or is taking advantage of prompt payment discounts offered by vendors. However, an increase in days’ purchases in accounts payable signals the company is having cash problems, and that its business operations are not generating enough cash to be able to meet its short term obligations.